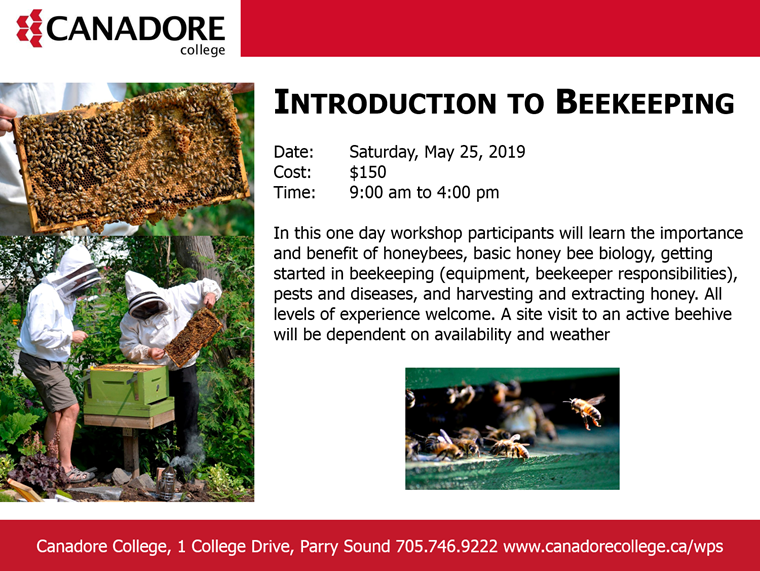 Registration is now open for Introduction to Beekeeping at Canadore College. The first meeting of 2019 is this Wednesday, March 13, 6:30pm at the Raymond Community Centre.Kelsey Ducsharm from Tech Transfer will be here to discuss the new antibiotic legislation and go over how to diagnose and deal with dead outs. Please note that our meeting dates for 2019 have been changed to Wednesdays and the current dates are always available on the home page. We also just added an August meeting. Just a reminder that our October meeting is this Friday, October 12, 6:30 at the Raymond Community Hall. The speaker had to cancel, so we will have lots of time for questions and bee talk. If you have something for “Show and Tell” bring it along to share with the other members. If you have some honey bring it along for a taste testing. Jane will be there to give a treasures report and issue club memberships for 2019. Melanie Kempfer from the Tech Transfer Team does is our speaker. These are the highlight from her talk. Projects this summer of 2018 …. 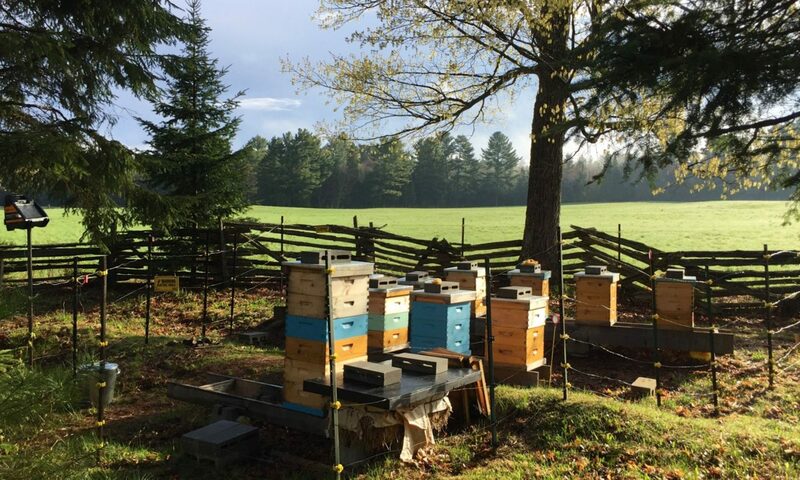 *Yard in Muskoka is being used to study, Beeomics. Good genetics for bees that are gentle, winter hardy, viable, healthy etc. This yard is isolated making it perfect for this type of study. *U of G – Testing prebiotics (similar to probiotics that humans may use). Prebiotics promote good gut health for the bees. May be added to pollen paddies for treating nosema and chalk brood as an alternative to fumagilin (which we can’t get anymore). Or don’t treat and it eventually gets better. Nosema is caused in times of stress for the bees. Minimize stress! *Queen Banking. Local bees are the best as transporting bees means a reduction of sperm viability. Tracheal mites can also be a problem in imported bees, not as much in local bees. The TTT has also purchased some infra red light guns to see what the bee cluster is doing in the hive during winter. Great for winter monitoring. *VSH – Varroa Sensitive Hygiene. Only in Quebec for varroa. *Grooming Behaviour – Testing for this behavior in bees as it keeps varroa mites low. *Mid-Season Treatment? Spring and fall is our typical time to treat for mites but varroa are at their peak in summer when it’s difficult or impossible to treat due to honey supers. Bees have a peak in their population but varroa don’t! Varroa increase in the fall, especially in July and August. The TTT is testing a new Oxcilic acid glycerin strip that the bees chew and it helps to break down the mite population (42 days). It’s just being tested now and must be tested for 3 years to be available to beekeepers. 142 colonies are in the test trial. *Breeding Program – 22 Breeders. Programs offered by TTT this year of 2018 …. Legislation to suppress antibiotic use in animal husbandry/beekeeping has meant that Fumagilin B is not being produced anymore (treatment for nosema). Melanie says that nosema usually sorts itself out eventually. Oxytet (treatment for foulbrood) will only be available for purchase from vets as of Dec. 1st, 2018. Suggested that we find ‘bee friendly’ vets. It was also suggested we might want to come up with a list of access to these vets. Small Hive Beatle – found in Niagara. Mel says SHB doesn’t cause considerable damage. Honey will slim up if left too long but SHB won’t damage the bees. *Did you monitor for mites?? We need winter bees! Mites decrease the chance for winter survival of bees. *Did you take honey or leave honey supers on for fall flowers? Do lots of monitoring in fall. *Colony Strength? Less than 8 frames of bees and they won’t likely survive the winter! *Queen Status? Will your queen survive the winter? If you suspect not, this is the time to requeen. A new queen will survive the winter better and start in the spring with gusto! *Wrap Colonies before the snow piles up. *Sticky board – 3 day drop. Close backs completely. *Alcohol Wash – ½ cup of bees taken from open brood frame for best results. Shake 2-3 frames of bees into a tub to take a broader sample. *Sugar Dusting – Doesn’t kill bees but not as accurate as some of the other monitoring systems. Use starchless icing sugar. *Feed before the bees cluster at +10 or less consistently. *Pollen paddies aren’t required in fall as much as in spring. *Winter Bees – “Fat Bees” vs “skinny bees”. Older bees have less fat on their bodies. You want healthy fat bees, enough bees. *Balance room for feed/nectar vs health vs population. *Protection – Use wraps and wind breaks! Wind knocks bees down very quickly!! *Wraps – later in fall is ok but leave on well into spring. Temps should be above 0 degrees at night consistently (May/June). When it’s safe to plant tomatoes it’s safe to take your wraps off! *Winter protection – trees, shrubs, fencing against cold winds! *Wraps – cardboard, tar paper, corrugated plastic, bee cozy, Ben Hogan wraps (like bubble wrap), winterizing boxes, Western wraps. *things to consider – R-value, durability, storage, convenience, cost? *Rob Key (president) puts forward a motion to move our meeting nights to Wednesday nights? 2nd Wednesday of every month requested. Motion passed by majority. *Advertising/ Getting known? Suggested that we look into a club business card and get sponsors to help with this. Mark makes a motion to look into this. 2nd by Heather Ferrier.